If you are planning to buy a bike under INR 1.25 lakh (ex-showroom Delhi), this could be the most useful link you have encountered from last few days. Here we have 15 bikes that fall right under the specific budget, that too carrying all the possible features that the brand could offer under this price tag. The range starts from Suzuki Gixxer, that too with double disc, at around INR 80,000 and goes up to Bajaj Pulsar RS200 at INR 1.23 lakh. Buyers with be surprised to know that only limited number of bikes offer ABS as an option. 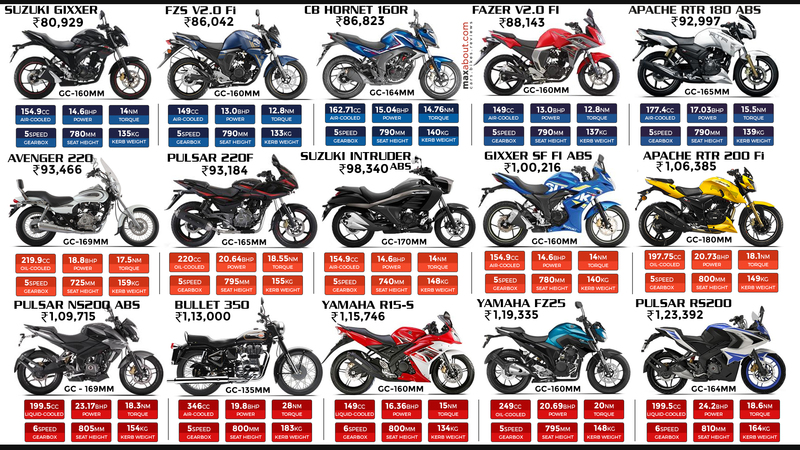 This list includes the recently launched dual disc variant for FZ-S while evergreen machines like Pulsar 220F and Avenger 220 are placed according to price. As Royal Enfield bikes are more expensive when compared to others, Bullet 350 is the only one that could make into this list of bikes under INR 1.25 lakh. For those who have flexibility of 10% over this limit, Classic 350 can also be bought at that price. *TVS recently launched RTR 200 with 2-channel ABS in India for INR 1.08 Lakh (Know More). The bike has not been listed on the official website yet, the reason we skipped it for now.